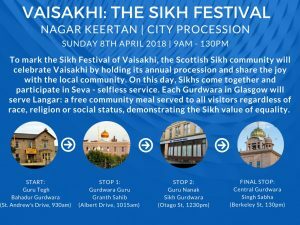 The Sikh festival of Vaisakhi will be celebrated with a Procession through the City of Glasgow, taking place on Sunday 8th April 2018. The procession is set to bring together thousands of people from diverse and vibrant communities to celebrate the festival of Vaisakhi. “Celebrating the Festival of Vaisakhi is always a highlight for Scottish Sikhs and has a special place in all our hearts because of it’s ability to bring people together from diverse backgrounds and communities.